In her intriguing book, Sheldrick explains how and why, in 1977, she established the David Sheldrick Wildlife Trust (DSWT) in Nairobi, Kenya. It’s named after her late husband, a famous naturalist who pioneered elephant conservation in Kenya, particularly at Tsavo East National Park where he was the first-ever warden. For her part, Kenya-born Dame Daphne has spent decades developing the Orphans Project in Nairobi and working on rehab projects in Tsavo East. Double thumbs up. The world needs more Dame Daphnes (find out more about her achievements here), not least because the ivory trade is still booming. According to CITES, more than 20,000 elephants were killed for their ivory last year across Africa, many of them mothers who left behind infants. 20,000 in ONE year. Mindblowing. The DSWT rescues the baby eles caught in the crossfire of poaching and hand-rears those who are still milk-dependent. Once they get to about 2-3 years old, they’re transferred to one of the DSWT’s rehabilitation areas inside Tsavo East National Park; from there, they’re eventually released back into the wild. And to date, more than 150 eles have been hand-reared and re-released. Let’s clap that. As luck would have it, I recently found myself in Nairobi with a day up my sleeve. So, I contact my mates at Twiga Tours and arrange a private guide – a top option if you are travelling alone with limited time. While I add in a few other places to the day’s itinerary (Kasuri Bead Centre, Giraffe Centre and the Karen Blixen Museum, where I gatecrash a wedding, obviously), my main mission is to get to the DSWT. I arrive at the centre just before 11am – that’s when the centre opens its doors to visitors to watch the orphaned elephants have a midmorning snack and a mud bath. I’m not prepared for the number of visitors – probably about 60 – but the more people who know about the DSWT, the better. Also, the centre kicks everyone out at 12pm, so we aren’t around long enough to cause the animals any major distress (they’re too busy partying to pay us humans too much mind, anyways). Watching the little hose-heads frolic in the dirt, test their trumpeting skills and chug from milk bottles, it’s humbling to think they literally dodged a bullet by coming to Sheldrick. During the hour, a keeper introduces each orphan and explains their history. Stash some Kleenex in your pocket when you visit – the stories will melt your eyes and curl your hands into fists. 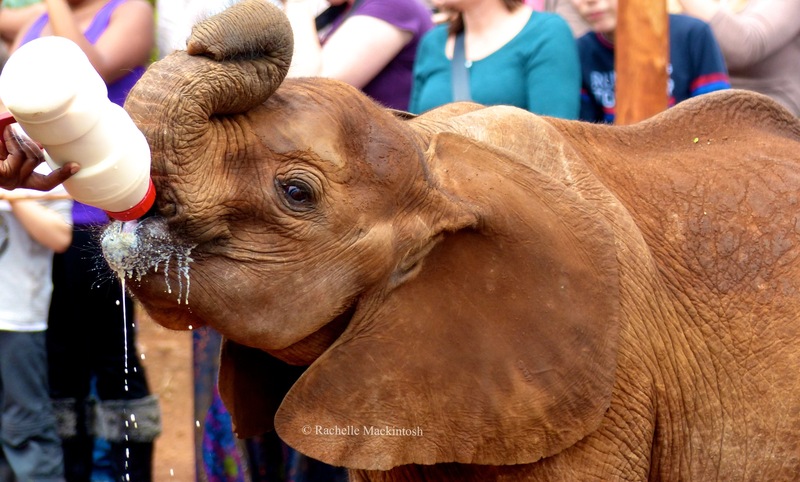 For example: little Murera was alone and barely able to walk when she was found. She’d stepped on an elephant trap – a poisoned spike that poachers use to incapacitate eles before killing them for their ivory. Barsilinga was just two weeks old when he was found next to his dying mum and her poacher-inflicted injuries were so severe that she had to be euthanised. Such stories are devastating to hear, but it’s so inspiring to see these animals living in a relaxed environment, where they are so loved and healthy. And knowing that most of them will find their way back to the wild where they can live out their days as nature intended … well … that’s why no one leaves Sheldrick without vowing to make a difference. Me? I sponsored Murera and plan to keep spreading the word about DSTW’s amazing work. If you’d like to get in on the action, head here to find out more about donating and/or visiting in person. *Many thanks to Twiga Tours for making this trip happen.